We’d love your help. Let us know what’s wrong with this preview of Best in Show by Kelly Jensen. Solitary mystery writer Julian Wilkes doesn’t want a pet, but his sister persuades him to visit Lingwood Animal Rescue, where he is immediately taken with a large ginger tabby cat. Before he can settle into the joys of cat ownership, however, he discovers something very unusual about his new companion. Macavity Birch is cursed. By day he is a large tabby cat. At night he ca Solitary mystery writer Julian Wilkes doesn’t want a pet, but his sister persuades him to visit Lingwood Animal Rescue, where he is immediately taken with a large ginger tabby cat. Before he can settle into the joys of cat ownership, however, he discovers something very unusual about his new companion. Macavity Birch is cursed. By day he is a large tabby cat. At night he can be himself—a human male with ginger hair and oddly yellow eyes. He didn’t mean to end up in the animal rescue, but he never meant any harm when playing the prank that resulted in his curse, either. Happily, Julian adopts him. But while exploring his host’s home, he discovers the diary of a long-dead relative. To ask other readers questions about Best in Show, please sign up. Julian Wilkes writes mysteries and a little romantic suspense, but since his last breakup he's been a bit blocked. When his sister persuades (read: harangues) Julian into adopting a pet he decides on a large ginger tabby cat. Macavity "Mac" Birch's pranks have gotten him into hot water before, but this time he's gone too far. Left for five days at Lingwood Animal Rescue, Mac's just happy he's been "rescued" before the little bit of magic he inherited from the woman his family calls "Aunt Clare" d Julian Wilkes writes mysteries and a little romantic suspense, but since his last breakup he's been a bit blocked. When his sister persuades (read: harangues) Julian into adopting a pet he decides on a large ginger tabby cat. Macavity "Mac" Birch's pranks have gotten him into hot water before, but this time he's gone too far. Left for five days at Lingwood Animal Rescue, Mac's just happy he's been "rescued" before the little bit of magic he inherited from the woman his family calls "Aunt Clare" disappears and the staff figure out he isn't really fixed. Clare Lingwood is actually Mac's great-great-great-grandmother, a witch, incredibly long-lived, and enormously protective of the family's secrets. She deals swiftly, and sometimes harshly, with anyone who may expose any of their secrets. When Mac finds out Julian's latest project is actually the journal of a witch, specifically Clare's sister Madeleine, he's desperate to try and get Julian to forget about writing about the Lingwood family, even if it means exposing their biggest secret. He did have a sensitivity to magic, though. He could feel it writhing through every page of the book. He was holding the journal of a witch. Of Clare’s sister Madeleine. Where had Julian found it? More importantly, what did he plan to do with it? This was so not good. The whole reason Mac had been cursed was because he’d done something that might expose Lingwood family secrets. It hadn’t—and he still thought Clare had overreacted—but if she found out about this journal, if she knew Julian had read it, frog spells would be the least of their worries. While this is cute overall, I would have really liked to see more chemistry between Mac and Julian. I also felt like the story had some wasted potential where it rushed through some plot points I was interested in in favor of focusing on others I wasn't. All in all though it's a cute, quick read with some humor. Advanced Review Galley copy of Best in Show provided by Dreamspinner Press in exchange of an honest review. Yes, I'll admit it...I'm a cat person and could totally see either of my cats as cat shifters and that made me love this book even more. Mac is a cat shifter and has been able to shift into his cat form since he turned 13. But recently, he offended his witch relative and she's made it so he can only shift into his human form during the dark of night. A twist of fate meant Mac ended up in the animal shelter which is where Julian found him. Julian is an introverted author. His sister thinks that a pet may make him more socially adaptable (i.e. a dog will get him out of the house and maybe interacting with PEOPLE). Instead he adopts a cat and begins an even more odd relationship...one with a standoffish cat...really, is there any other kind? But what he doesn't realize is that his cat turns into a man at night...although that would explain the food and beer he can't remember consuming. This was a totally fun read. I loved Mac and the stress of his situation, and I absolutely fell in love with Julian and the nurturing, caring soul he has. I loved how he would talk to Mac and really considers and worries about keeping the cat happy. Julian may be introverted, but he's lonely and really wants the companionship. There's an interesting twist to the story with the witches and the journal that Julian bought for inspiration for his latest novel. I would have LOVED to have delved deeper into all this...seriously, this book would have worked wonderfully as a full length book going into all they mystery and lore there. But as it is it was a really fun read that kept me smiling throughout. I love the idea of a housecat shifter. Hay poco romance, y de ser sincera, parece casi metido en el final con calzador, pero la idea del chico convertido en gatazo a rayas es super mona. Well, I thought it was cute. I was exceptionally amused with the reason why Mac was cursed ((view spoiler)[Entering a cat show, Mac? Seriously? *LOL* (hide spoiler)]). I enjoyed Mac and Julian interaction, including when Mac became that grumpy cat who refused to purr (*grin*). What annoyed me about this novella was the Aunt character though. I thought she was kind of a bi*ch for me. (view spoiler)[When she turned Julian into a mouse (hide spoiler)] I was ready to slap her and I was unsatisfied that she pretty much got what she wanted easily just because she was a witch. HMPH!! This was so freaking adorable! Julien is a lonely writer in a serious rut. He hasn’t written a thing in three years after a break up leaves everything inside him stale. His sister pushes him to adopt a dog, he ends up adopting a cat and that’s where the magic begins… literally! This love story has a twist. In this world witches are absolutely real and living next door. Mac isn’t your normal house cat and the irony that he and Julien become paired is awesome. Fate, magic and love. Three things this sweet novella has that work brilliantly together. Kelly Jensen has written an angst free, exciting and fun story that you’ll absolutely fall in love with! Who doesn't love a big dose of magic and fantasy with their reality? Bravo!! So much cuteness in one story. Oh, sweet and lighthearted fun. They were so shy with each other and thinking the other too good/sweet for them... adorable. A fun story with characters and a shifter I really liked. I would love to read a sequel where Julian gets his writing mojo back and Mac finds a career. And where their relationship deepens, of course! This will be a very short and enthusiastic review, because these guys are just so freakin' CUTE (TWO cinnamon rolls!) and the plot has some scare to it and the ebook is $0.99 so don't just sit there, go get it! ’ll admit, I was drawn to this one by the “stuck in cat form” aspect, as well as the atypical shifter angle, and in this area I think the story does well. Jensen does a good job bringing out Mac’s kitty side. He starts off with kind of an aloof self interest (oh so common in cats), until he gets to know Julian and sees what a sweet guy he is. And when Mac is stuck in cat form, he is just so feline and all his little behaviors reminded me so much of my cats. There A Joyfully Jay review. ’ll admit, I was drawn to this one by the “stuck in cat form” aspect, as well as the atypical shifter angle, and in this area I think the story does well. Jensen does a good job bringing out Mac’s kitty side. He starts off with kind of an aloof self interest (oh so common in cats), until he gets to know Julian and sees what a sweet guy he is. And when Mac is stuck in cat form, he is just so feline and all his little behaviors reminded me so much of my cats. There is some light playfulness here as Mac is forced to sneak around Julian’s house in human form when he changes at night and as he deals with being forced back into a cat every morning. I also liked watching how these guys interact when Mac is in cat form and is trying to communicate with Julian. Mac reveals the truth to Julian fairly early on, so the tension there ends pretty early in the book. But I think it works since we still see Mac stuck in his curse as the guys try to navigate their new friendship and fledgling relationship. So from the shifter side and the connection between the guys, I think the story works. But the larger plot regarding Mac’s family secrets and the journal it didn’t all come together for me. I guess I was expecting more magic, more mystery, and more intensity here and things remain pretty low key. Mac is freaked out that Julian has this journal, but the secrets that are revealed are nothing that seems to warrant that level of anxiety. There also really isn’t any mystery uncovering; Julian just reads the story and learns the truth. I just felt like there was a lot of potential to this part of the storyline, but as it was, things fell kind of flat and I am not sure it added much to the overall story. Read Jay’s review in its entirety here. Julian is forced by his sister to go to the Lingwood Animal Rescue Center to adopt a dog to force him to interact with other, but when they get there Julian feels compelled to adopt a big, ginger tabby cat named Marmalade instead, even if he has no clue why. Once they're home and are settling into life together, some weird things start happening and Julian starts to feel like he might be losing his mind. Macavity "Mac" Birch is cursed, he is a cat shifter, so he's been able to change into a cat ever since he was thirteen, but now due to one of his pranks gone wrong, his 'Aunt' punished him by only being able to change back into a human at night. He never intended to end up at the Rescue Center or to be adopted by Julian, but now that he is, well, he'll make the most of it. When Mac discovers a diary from one of his ancestors in possession of Julian, he starts to fear what his 'Aunt' might do his new friend if, or rather when, she find out he has it. This was a very cute read! Julian was sweet and oblivious, and I really liked that he took things in stride, once he stopped freaking that he was going insane that is. Mac was lovable, both as a cat and as a human, he was a bit immature, but he showed great character growth once he realized some of the things he'd done wrong and tried to make them right. I just loved them together, too. They were fun and while very different, they helped each other be the best version of themselves they could be. The writing was really good, the progression was great and the mystery was very interesting and kept my interest. My only complaint is that I felt the ending was a bit abrupt, but other than that, this was a very enjoyable read! Recommendable! "Mac reached for Julian's cheek, and when he didn't jerk away, pressed the back of his hand to the warm skin. He didn't know what to say. Maybe words weren't necessary." 3.5 Here Kitty stars!! Quirky and different, but refreshingly cute! Julian is a mystery writer, who spends most of his time alone. His sister convinces him to go to an animal rescue shelter to get a pet. While there he falls for an adorable orange cat and adopts him. Once home, he notices there's something different about his new "Mac reached for Julian's cheek, and when he didn't jerk away, pressed the back of his hand to the warm skin. He didn't know what to say. Maybe words weren't necessary." I'm not usually a shifter fan, but I thought the blurb was interesting. And while I was entertained by the book overall, I just couldn't really get into the story. Not that the story was horrible, I just never connected to Mac and Julian as a couple. There were definitely parts that I chuckled and found myself invested, but other times, I just wasn't into it. Overall a pretty cute book, but definitely different! Written with a great deal of humor, this is a hilarious story about a lonely mystery writer named Julian and the pet he is “forced” to get by his sister. Only, the big tabby cat by the name of Mac is actually a cursed man on the run from his family. As suspected, trouble follows these to anywhere they turn, and the magical mystery they have to solve is quite intriguing. Mac is delightfully catlike in his behaviors during the day. When he changes into a man at night, he discovers that the diary Ju Written with a great deal of humor, this is a hilarious story about a lonely mystery writer named Julian and the pet he is “forced” to get by his sister. Only, the big tabby cat by the name of Mac is actually a cursed man on the run from his family. As suspected, trouble follows these to anywhere they turn, and the magical mystery they have to solve is quite intriguing. Mac is delightfully catlike in his behaviors during the day. When he changes into a man at night, he discovers that the diary Julian is researching for his next book belonged to one of Mac’s ancestors – and Mac panics. His family secrets are not to be shared, but what is he supposed to do? He hadn’t originally planned to stay with Julian, only needed a human to rescue him from the pet shelter, but Julian charms him with his guileless naivete and Mac is tempted to stay – something he has never had to deal with before. If you like your romances with a sprinkle of magic, a touch of mystery, and a large helping of humor, if you want to see two total strangers figure out who they really are and how they might fit together as a couple, and if you’re looking for a very entertaining read, then you will probably like this novella. Very cute story! A bit of a romantic comedy, but not over-the-top with the awkwardly humorous moments. I love that the conflicts between the MCs were resolved like adults. Awkward adults. But adults who aren't too afraid to talk about things (even if there's hesitance). Head-canoned Mac as Eddie Redmayne. You can ready my review of “Best in Show” at my web site. I'm not sure why this makes me so happy, but it does! Super cute cat shifter book. I just wish it was longer. I hope the author revists this world because I liked the world building and there are definitely more stories to be told! I really liked the premise of this book and that's mostly the reason I bought this one. And after reading and enjoying two of this authors other books already I bought this one and hoped I would enjoy this one too. Best in Show is a fun short read about a mystery writer who adopts a cat, who actually turns out to be a shapeshifting human. This was a very fun and enjoyable story. I really liked the story and the whole premise with Mac being stuck in cat form and Julian adopting him and thinking he I really liked the premise of this book and that's mostly the reason I bought this one. And after reading and enjoying two of this authors other books already I bought this one and hoped I would enjoy this one too. Best in Show is a fun short read about a mystery writer who adopts a cat, who actually turns out to be a shapeshifting human. This was a very fun and enjoyable story. I really liked the story and the whole premise with Mac being stuck in cat form and Julian adopting him and thinking he was a normal cat. And then the shock when he finds out he isn't a cat. It also was fun to read about a shape shifter who turned into a normal house cat. I thought it was a fun twist on the standard shifters and it made for an unique story too. Seeing Mac's point of view as a cat was well done too. My main complaint about this book is that it was too short. It was such a fun read and I just wanted it to be longer. There were some parts at the ending that felt a tad rushed, but the first half or so was well paced. The romance also developed a bit quickly and I would've liked to get a better feel for both main characters. Having said that I did like both main characters. Mac was a bit mischievous, but eventually also realized that not all of his pranks were funny and he did have a soft side as well. Julian had a bit of a hard break-up and has lost his way after that and Mac and a diary he finds change that. It was nice how we got a bit of a feel for their personalities, although I would've liked to read a bit more about them. There are a few side characters, most noticeably Mac's aunt and Julian's sister, who both play an important role in this story. They aren't the most likeable of characters, but are important for the story. And Julian's sister did seem to care about Julian, even tough she was a bit pushy. The romance develops a bit quickly, but I did like these two together. I just would've liked to see a bit more of them and them together. There is a bit of heat towards the end and a bit of a happy for now ending. We learn a bit about how magic works, that there are witches and shifters and a bit of history of the town involving some of the witches. The diary plays an important role in that part of the story. I just wish this part was delved into a bit more as it felt like there was room to work this concept out a bit more and learn more about the world. Best in Show is a cat shifter story. The MCs are Julian Wilkes, a mystery writer, and Macavity ‘Mac’ Birch, a cursed male witch, who lives his life as a cat by day, and human at night. The story is told in third person through both MCs povs. This is a cute, adorable story that takes place mostly in Julian’s home. He does make a trip to the humane society with his sister to adopt a dog at his sister’s urging, but once he sets eyes on Mac, he decides to adopt the large, ginger tabby. 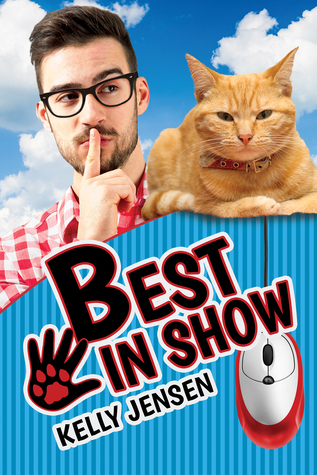 Best in Show is a cat shifter story. The MCs are Julian Wilkes, a mystery writer, and Macavity ‘Mac’ Birch, a cursed male witch, who lives his life as a cat by day, and human at night. The story is told in third person through both MCs povs. This is a cute, adorable story that takes place mostly in Julian’s home. He does make a trip to the humane society with his sister to adopt a dog at his sister’s urging, but once he sets eyes on Mac, he decides to adopt the large, ginger tabby. Before I go further with the review, I want to mention the cover. I love it! I don’t know who made it, but it’s one of my favorite covers of the year. Absolutely brilliant. We find out that Mac has been cursed by his grandmother for a stunt he pulled, which I didn’t think was all that bad. But it seems that Mac is prone to taking things lightly. He doesn’t realize the effect his actions have on others or doesn’t seem to care. Not until he meets Julian. At first I didn’t like Mac, because he’s immature and selfish. But he grows as he experiences Julian’s kindness. Julian is a nice guy and a mystery writer who’s been in a writing slump. He purchased a book and decided to write a mystery based on the book. The problem was, the book is based on fact. When Mac finds out the book is about his family, he knows that Julian is going to get into serious trouble, especially if Mac’s grandmother, or great-grandmother, he’s not sure which, finds out. Mac warns Julian not to write the story or to mention it, but it’s too late. Somehow, the grandmother finds out. I didn’t think the title really suited the book well since it didn’t feature prominently in the story. Despite the blurb, I thought it meant Julian would enter Mac in a cat show, but it had nothing to do with it. So the title was a bit misleading. OMG! I had no idea that this was a shifter book. What a wonderful surprise! And Kelly Jensen pulled it off with such ease. I purchased the book nearly two years ago and had completely forgotten its premise. This is how I like to read a book, determining I want to some time ago - then letting it marinate, in this case the result is an entertaining novella about an uncommon shifter - the regular house cat. Though Marmalade is far from your average house pet, though he did have that catitude we who OMG! I had no idea that this was a shifter book. What a wonderful surprise! And Kelly Jensen pulled it off with such ease. I purchased the book nearly two years ago and had completely forgotten its premise. This is how I like to read a book, determining I want to some time ago - then letting it marinate, in this case the result is an entertaining novella about an uncommon shifter - the regular house cat. Though Marmalade is far from your average house pet, though he did have that catitude we who are owned by cats come to know and love. His adopter, as reluctant as he was felt a kinship to the big (ginger) red tabby. Julian found himself talking to his new housemate. Making sure the big red stripper kitty was comfortable. His darn sister was right! Julian didn't realize how lonely and isolated he'd become. But with a new pet & an interesting subject to resume his writing career, Julian was feeling decidedly chipper. I'm not sure why this book isn't rated more highly hence my rounding up from 3.5 stars. Sure, it isn't quite complete in its wrap but nothing that would keep you really wondering. And it is pretty short. But it is super cute. This really shouldn't have worked for me, but it totally did! I don't tend to like sweet/silly books, but I loved this. I don't care much for shifter stories, but this was so not the average shifter story that it worked perfectly. I'm a dog person, through and through, but I loved Mac's cat perspective. This is definitely something to read when you want/need to smile and feel all the mushy feels. Absolutely adorable! ★★★ = It wasn't bad but it wasn't great. It was just good. Short but fun. About witches and shifters. Liked the character's interaction and the fantasy aspects but it was very short. I wanted more! This was a fun short with a cat shifter who's cursed to stay in his cat form during the day by his witchly great-great-great-grandmother. I really enjoyed the story & would love to see more from this universe or to see the story expanded. Short, amusing bit of fluff. I liked both of our heroes, but maybe I wanted just a wee bit more to the story (so I could remember it s week from now). If aliens ever do land on Earth, Kelly will not be prepared, despite having read over a hundred stories of the apocalypse. Still, she will pack her precious books into a box and carry them with her as she strives to survive. It’s what bibliophiles do. Kelly is the author of ten novels–including the Chaos Station series, co-written with Jenn Burke–and several novellas and short stories. Some of what If aliens ever do land on Earth, Kelly will not be prepared, despite having read over a hundred stories of the apocalypse. Still, she will pack her precious books into a box and carry them with her as she strives to survive. It’s what bibliophiles do. Kelly is the author of ten novels–including the Chaos Station series, co-written with Jenn Burke–and several novellas and short stories. Some of what she writes is speculative in nature, but mostly it’s just about a guy losing his socks and/or burning dinner. Because life isn’t all conquering aliens and mountain peaks. Sometimes finding a happy ever after is all the adventure we need.